Last Thursday in West Potomac Park, the Boys and Girls club of America held their annual Triple Play Day. Under nearly 100 degree weather and near the Potomac River, the kids of the club took part in a variety of activities and games, from general agility exercise to healthy takes on checkers and Jenga. 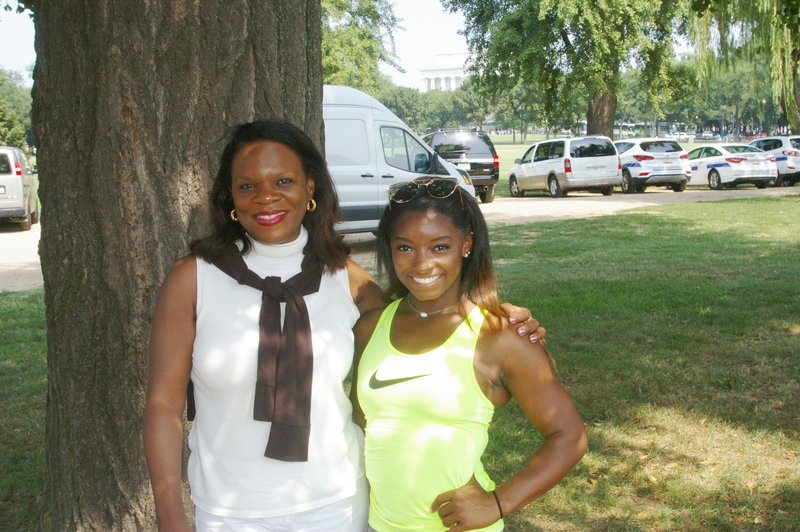 In attendance was Olympic Gold Medalist Simone Biles. DC Spotlight editor Wendy Thompson caught up with her to get her take on the event and the potential of the kids in the club. 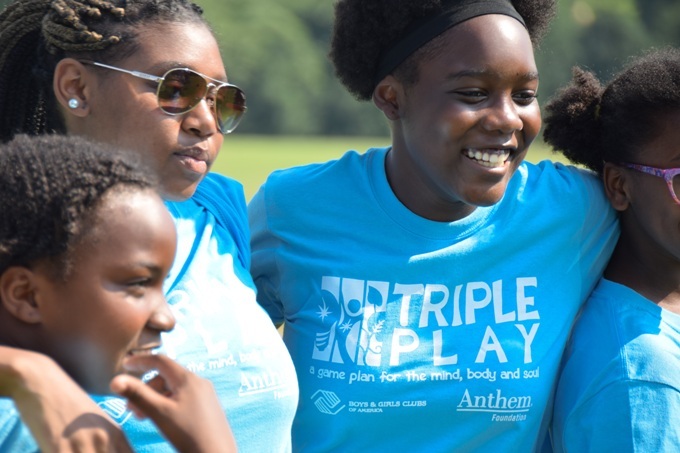 Staff writer Alex Sniatkowski also spoke with Jennifer Bateman, Ph.D., National Vice President of Programs, Training & Youth Development Services at Boys & Girls Clubs of America about the goals of Triple Play Day and the future of the program. THOMPSON: Simone, how old were you when you got into gymnastics? BILES: I was late to the sport, but I was six years old. THOMPSON: So when you look at these kids out here playing today, could you see another Simone Biles out there? BILES: Yes. If they choose to do gymnastics and that’s the level they get to…definitely. Hopefully, anything else they do, they can still get to the Olympic level, or even the collegiate level. That’s amazing too. You can get scholarships and go to school for that. THOMPSON: Kids today are using video games and computers and not getting the exercise they need, this is a great event to emphasize fitness and healthy living. Do you think we need more events like this? BILES: I feel like the more events open kids eyes and inspire them, the better. It’s helpful for kids to see their role models participating in these activities, because then they want to replicate just that. Other than that, it’s just exciting for them to be active, and then if they fall in love with something, then they can take that back with them. THOMPSON: So how important was it that your parents and your family supported you? BILES: I feel like it does take an army, and not only just for an [athlete’s] immediate surroundings, like my coaches and my mentors. To be supportive of what I did, it was helpful to have my family’s support as well. THOMPSON: This event is called Triple Play. With an event like this, can you explain what that means? BILES: It’s the three key roles for these kids: mind, body, and soul. Once you have those intact, it creates a better athlete. THOMPSON: What type of activities are the kids out here doing today? BILES: There are stations for Tic Tac Toe, Connect Four, and other activities. They also have an eating station with granola bars, fruits, and water. THOMPSON: We have a huge obesity problem in this country. How important is food for the kids? BILES: I think a lot of kids think that sweeter foods taste better and don’t realize that fruit also can have those same enjoyable qualities. So hopefully, they can fall in love with them as well. THOMPSON: Do you think we need more activities like this? THOMPSON: Do you see this event becoming a trend? BILES: They have one every year, which is pretty cool, and I think once you have them more, it opens up the kids eyes. At the event were also representatives from the Boys and Girls Club of America, along with their cosponsors, the Anthem Foundation and Coca Cola. 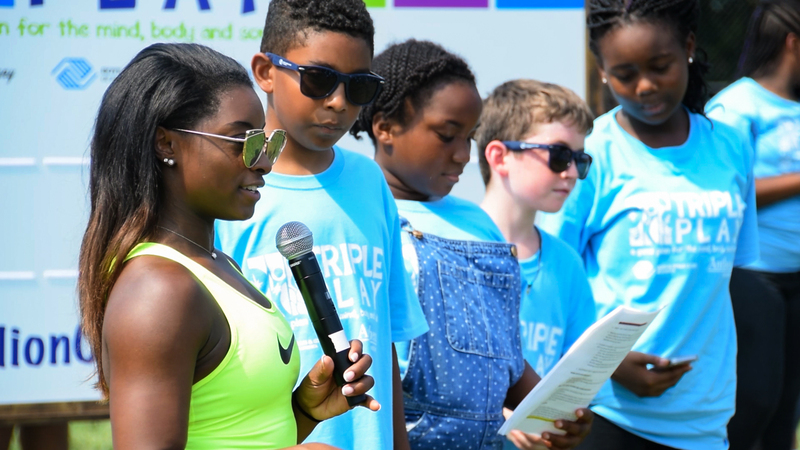 DC Spotlight’s reporter Alex Sniatkowski spoke with Jennifer Bateman, Ph.D., National Vice President of Programs, Training & Youth Development Services at Boys & Girls Clubs of America about the components of Triple Play exercising and the future of the program. SNIATKOWSKI: Could you tell me a little about the Triple Play program for Boys and Girls club of America? BATEMAN: The Triple Play program is the second most utilized program in the movement. We have hundreds of thousands of kids engaged in it every single day. It’s got three components: a nutrition education curriculum called healthy habits. Then there are daily challenges, which is fun games for the kids. It’s your time at the gym, playground, or outside, where the kids don’t even know they’re getting activities, because they’re truly playing along with their peers. Then it’s social recreation, which is your team building and relationships, your coping with challenges, problem-solving component that really happens in our games room. So it’s really the heart and the soul of club. And for alumni, when you really ask them what they remember about the club, they may not always have the language, but they’re always talking about some component of Triple Play. SNIATKOWSKI: How many kids are participating in this event today? BATEMAN: There are 340 kids from across the greater Washington Boys and Girls clubs. SNIATKOWSKI: Your goal is to spend 5 million minutes doing activities. 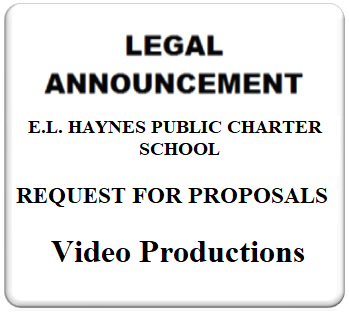 How do you plan on reaching this? BATEMAN: We have 400 engaged and dynamic clubhouses that have signed up with us today out of our 4300 clubs to achieve this goal. Every year the goal gets bigger, but it’s really about those 5 million minutes of physical activity and social recreation components and working together to recommit ourselves to healthy lifestyles. SNIATKOWSKI: Will you be continuing the event next year? BATEMAN: We will continue it annually and every year we’ll raise the goal too and look for a greater commitment across the movement. Previous ArticleCALENDAR OF EVENTS – August/September 2017 – Fun Things to Do in Washington, D.C.